The NAECOLOY® Family of Silver Alloys are contact materials with high electrical and thermal conductivity, dissipating heat and also resist atmospheric oxidation better than most metals, providing low film resistance to reduce voltage drop and keep temperature rise to a minimum. 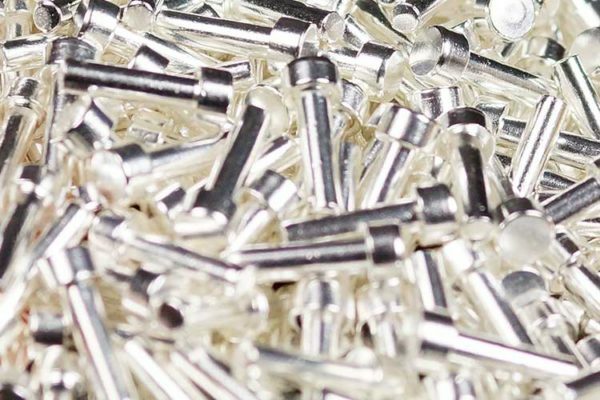 NAECOLOY FS999 is 99.9% pure silver, highly conductive, ductile and easily made into a variety of forms including tips, rectangles, discs, buttons, strip and rivets. The addition of other elements to silver can enhance the physical properties of the alloyed material, making them the perfect materials for specific applications. NAECOLOY C900 has 10% added copper for increased hardness. NAECOLOY C995 benefits from the addition of small amounts of magnesium and nickel providing unique physical properties. The addition of base metals (such as copper or nickel) to silver will provide greater hardness and resistance to wear, abrasion and impact forces.